This week we are learning about Massive Open Online Courses, or MOOCS. These courses allow for a greater audience to be reached. I am creating an Ultra Micro MOOC about a Project-Based Learning. In my “PBL Palooza” course my peers will master Project-Based Learning by creating a PBL unit and sharing it with their peers to be critiqued. This course is expected to attract any innovative teachers interested in teaching using PBL. This course will teach you what exactly PBL is and what the advantages of PBL are. It will break down the different components of Project-Based Learning and explain each in depth. At the end, each participant will have created their own PBL unit. This unit will be created in steps over the span of the course as we cover each component. As educators, we are busy and do not always have the time to attend seminars held on fixed dates. This micro MOOC is the solution. Participants can learn and create a PBL unit on their own time, while having the opportunity to discuss PBL with, ask questions to, and receive feedback from their like-minded peers. Upon completion of this seven-week course, all participants will be able to create and implement a Project-Based Learning unit. They will have a deep understanding of the components of PBL and why it is so beneficial to students. Each participant of this course will create a Project-Based Learning unit on the topic of their choice. 1. A problem or a need – there must be a problem of practice or an educational need that should be addressed during the lesson. Educators want to learn more about how to create and implement Project-Based Learning units into their classroom and this micro MOOC addresses that need. 2. A real-world performance – how the learning objectives fit into a real-world activity or need. The participants of my micro MOOC will be creating a PBL unit of their own that they can implement into their classroom. 3. An instructional objective – the objectives are based on the final outcome, activity or test. Each module contains an objective of completing a portion of the participant’s PBL unit, leading to the final outcome which is the complete PBL unit. 4. A set of essential content – the basic ideas and skills that will allow the learner to complete the task or understand the content. Each module provides the necessary information about PBL that guides participants towards understanding each component of PBL. 5. An evaluation consisting of a test or observation – an assessment, observation or product providing evidence that the objectives have been accomplished in the real-world setting. The final evaluation will be the peer critique of each participant’s complete PBL unit. 6. A method to help participants learn – the method to deliver the content; a lesson. Each module will contain a learning target, the necessary information about PBL, and an activity for participants to complete and share. Together, these will deepen their understanding for what a Project-Based Learning unit consists of. Each week builds off of the last. I begin by introducing PBL and giving the background behind it. From there I go into detail about each of the components of a PBL project. These are presented in the order they are in an actual PBL unit so there is a natural flow to the modules. At the end of each module, each participant will be asked to then create and share that portion of the PBL unit (if applicable) along with any thoughts or questions they have. Domain- A domain of knowledge creates common ground, inspires members to participate, guides their learning and gives meaning to their actions. Community- The notion of a community creates the social fabric for that learning. A strong community fosters interactions and encourages willingness to share ideas. Practice- While the domain provides the general area of interest for the community, the practice is the specific focus around which the community develops, shares and maintains its core of knowledge. In order to have a successful CoP, there must be social pressure (Tu, 2002), motivation (Ardichvili, Page & Wentling, 2003), and collaboration (Sveiby & Simon, 2002). My micro MOOC creates social pressure by having participants share the work they create by a set deadline. It also motivates participants to participate since they will receive constructive feedback on their work. Lastly, my course will provide a collaborative environment where peers can get together and share, ask questions, and discus what they are learning. By participating in this course, peers will develop of network of like-minded professionals. Throughout the course, peers will be evaluating and critiquing each other’s PBL units as they progress. This allows for participants to ask questions and receive feedback from each other. Each of the seven modules in my course will be one week long. This will give participants ample time to complete the necessary research and create that week’s assignment. I have structured each week as “Launch, Explore, Summarize”. This format clearly breaks down the target, information, and tasks for the week. In the “launch” portion of the module, I will introduce the topic for the week and what the learning target is. For the “explore” portion, I will provide sources for participants to learn from as well as questions to guide their thinking. Finally, for the “summarize” portion, participants will be sharing via discussion forum what they have learned and completed that week along with any thoughts or questions they may have. 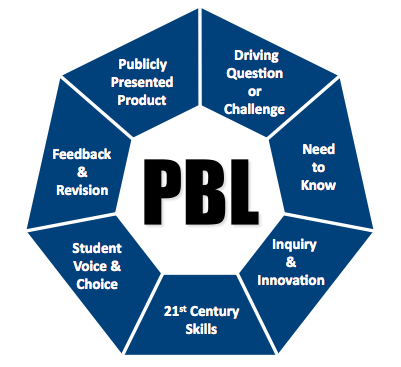 MODULE 1: What is PBL? Explore: With Project-Based Learning, students explore real-world problems. PBL engages students and gives them the 21st century skills that they need for the real world. Students will be thinking deeply, problem solving, collaborating, communicating, and innovating every step of the way (Edutopia). Summarize: Post a comment about your thoughts about PBL so far and a question you still have. If you are able, answer your peers’ questions. Launch: You will learn about the components of a PBL unit and come up with a topic for you PBL unit you will be creating. Entry Event– This is an event that should generate interest in curiosity about your unit. This could be a guest speaker, a video, or fun presentation. Driving Question- This should be an open-ended question that students must answer at the end of the PBL unit. Everything students do will link back to this question. Need to Knows- These are questions that students generate. They are sub-questions that must be answered in order to answer the over-reaching driving question. Inquiry- This is the phase where students will research and answer their need to knows they came up with. Final Product- This should be a product of student choice and will be presented to an audience other than the class. Follow this link to find planning forms to use as you begin to plan out your own PBL unit and this link to find rubrics to use to assess your students in the different areas of their PBL projects. Summarize: Post your PBL topic and why you think that topic lends itself well to PBL. Explore: An entry event must be a brief but memorable activity that will spark curiosity in interest in students (Edutopia). Summarize: Share what your entry event will be for your PBL unit and how it is going to create curiosity among your students. Launch: This week you will be looking at what a driving question is and thinking about how it guides your students’ inquiry. Explore: What is the driving question? How does it guide inquiry? Check out this link to learn more about how to refine your driving question. Summarize: Share your driving question on the discussion forum. Also, post and answer any questions! Launch: You will be thinking about the process of developing the need to knows for your PBL unit. You will need to think about how you will guide your students thinking through this process. Explore: Your students will develop of collection of need to knows. This will be a comprehensive collection that will drive their inquiry. The need to knows should guide students to learn everything they need to in order to answer the driving question. Summarize: Share your thoughts to the following questions to the discussion forum: How will students come up with their need to knows? How will these drive their inquiry? How will you, as a teacher, guide them? Launch: You will learn what the final product of a PBL unit looks like and how to present it. Summarize: Share via discussion forum some examples of what students could choose for their final product for your PBL unit and how you will guide their creativity. Also share who your presentation audience would be. As always, post and answer any questions! Launch: You will be sharing your final PBL unit this week! Explore: Read your peers’ PBL units and evaluate them using the information you have learned. Summarize: Post a link to your completed PBL unit in the discussion forum. Choose one peer’s unit to read and critique carefully. Provide that person your thoughts on their unit and provide any constrictive feedback that will help them improve their unit. Ardichvilli, Alexander; Page, Vaughn; Wentling, Tim (2003). “Motivation and barriers to participation in virtual knowledge sharing in communities of practice”. Journal of knowledge management 7 (1): 64–77. doi:10.1108/13673270310463626. BIE. Retrieved June 6, 2014, from http://bie.org/about/about_bie. Buck Institute for Education. (2013, July 17). Katherine Smith School Kindergarten Presentaion Project . Retrieved from https://www.youtube.com/watch?v=cPuQ5_Tr7qo. Edutopia. Project-Based Learning. Retrieved June 6, 2014, from http://www.edutopia.org/project-based-learning. Manor New Tech High School. (2008, August 26). MNTHS: “gilgamesh- ancient espionage” entry document . Retrieved from https://www.youtube.com/watch?v=XqQFKnO8YcE. [PBL image]. Retrieved June 6, 2014, from http://modelschoolscnyric.pbworks.com/w/page/40580862/Project-Based%20Learning. Seven Essentials for Project-Based Learning. ASCD. Retrieved June 6, 2014, from http://www.ascd.org/publications/educational_leadership/sept10/vol68/num01/Seven_Essentials_for_Project-Based_Learning.aspx. Sveiby, Karl-Erik; Simon, Roland (2002). “Collaborative climate and effectiveness of knowledge work – an empirical study”. Journal of Knowledge Management 6 (5): 420–433. doi:10.1108/13673270210450388. ISSN 1367-3270. Tu, Chih-Hsiung (2002). “The measurement of social presence in an online learning environment”. International Journal on E-learning. April–June: 34–45. Wenger, Etienne; McDermott, Richard; Snyder, WIlliam M. (2002). Cultivating Communities of Practice (Hardcover). Harvard Business Press; 1 edition. ISBN 978-1-57851-330-7. Yelon, S. L. (2001). Goal-Directed Instructional Design: A Practical Guide to Instructional Planning for Teachers and Trainers. Michigan State University: Self-published, Not in electronic format. Sign me up! I love that the final product of the class is something teachers can then implement right away with their students. This mMOOC would be nice to take over the summer and then have the PBL unit ready to go for next school year.